The eyelids are among the most delicate features of the face. They are not only the thinnest skin on the entire body, but they have important functional roles as well. It takes a skilled and talented surgeon who is trained in the latest plastic surgery techniques to reconstruct the eye to its natural form and function. Although Dr. Stong offers the most advanced cosmetic procedures to improve the signs of aging around the eyes, he is remarkably skilled when it comes to eyelid reconstruction and facial reconstruction surgery. Oculoplastic Surgery or Eyelid Surgery can be performed on the upper or lower eyelid, or both. It is primarily used in patients who need reconstruction after minor trauma or after the removal of skin cancer defects in Mohs surgery. Dr. Stong also provides eyelid surgery for those that have a droopy upper eyelids (ptosis) or loose lower eyelids (ectropion). Mohs surgery is a sophisticated procedure that removes cancerous cells and cancerous growths in the skin. 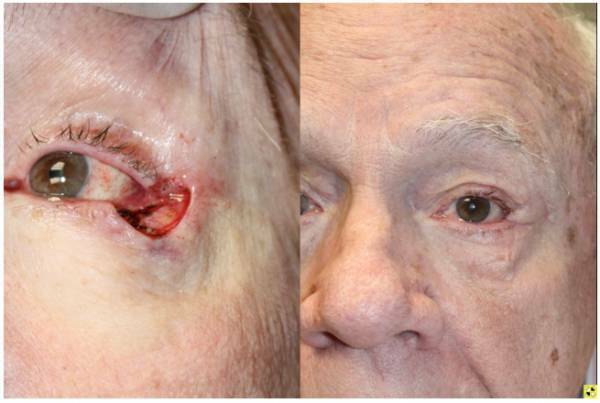 When performed on the eyes, it can leave patients with large, gaping wounds. At this point, Eyelid Reconstruction is needed to repair the aesthetics and function of the affected eyelid. Dr. Stong is a dual board certified facial plastic surgeon who understands the importance of aesthetics and functionality when it comes to the eyelid. 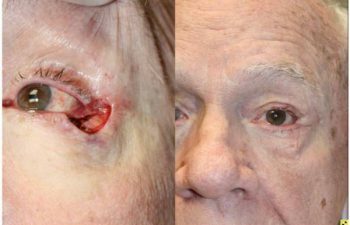 Not only can he successfully restore the eyelid back to its natural appearance, but he preserves the health of the eye at all times. Eyelid reconstruction after Mohs surgery typically involves the use of skin flaps or skin grafts and cutting-edge technique. Eyelid reconstruction may also be needed for individuals who suffer from eyelids that have an irregular shape or contour, such as bedroom eyes (upper eyelid ptosis) and excessively loose lower eyelids (ectropion). 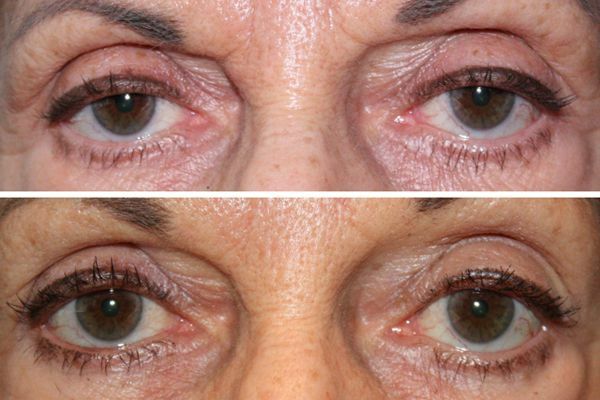 In these cases, eyelid surgery can revitalize their appearance and restore proper function. Eyelid reconstruction can also relieve the common symptoms associated with upper eyelid ptosis or lower eyelid ectropion, including excessive tearing (epiphora), obstructed vision, and dry eye. Dr. Stong uses careful precision and delicate artistry when tightening and repairing the lower or upper eyelids. Patients who choose ptosis repair or ectropion repair are able to regain comfortable function of the eyelids and benefit from a revitalized and natural-looking eye appearance. 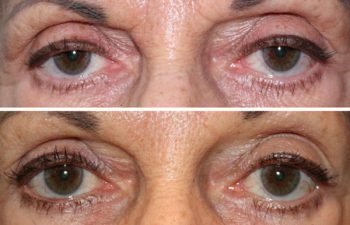 If low hanging upper eyelids or droopy lower eyelids are negatively impacting your quality of life, please contact Kalos Facial Plastic Surgery, LLC to schedule a consultation. Dr. Stong will carefully examine your reconstructive needs and recommend the most effective solution to restore your eyelids the way you need and deserve. Eyelid surgery offers countless benefits for both men and women, including those that impact the health of your eye and those that can boost a patient’s self-esteem. If you have an eyelid imperfection, either from birth, after trauma or as a result of Moh’s surgery, choose Dr. Stong as your trusted Atlanta oculoplastic surgeon. 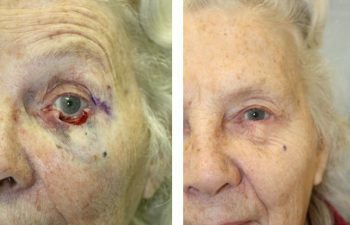 Although the recovery timeframe differs from patient to patient, one can expect a quick recovery from oculoplastic or eyelid surgery. In addition to eyelid surgery, our Atlanta practice offers a full range of advanced reconstructive surgeries to restore minor or major imperfections of the face. Contact Our Atlanta Oculoplastic Surgeon Today! If you have any questions regarding our Oculoplasty procedures, please contact Kalos Facial Plastic Surgery LLC today to schedule your appointment.